You know how much I love to munch on things, so snack foods are something I'm always eager to try when traveling. And one of my absolute favorite snacks? Popcorn! During my recent trip to Sydney, I of course had to try most of the snacks provided in my office. 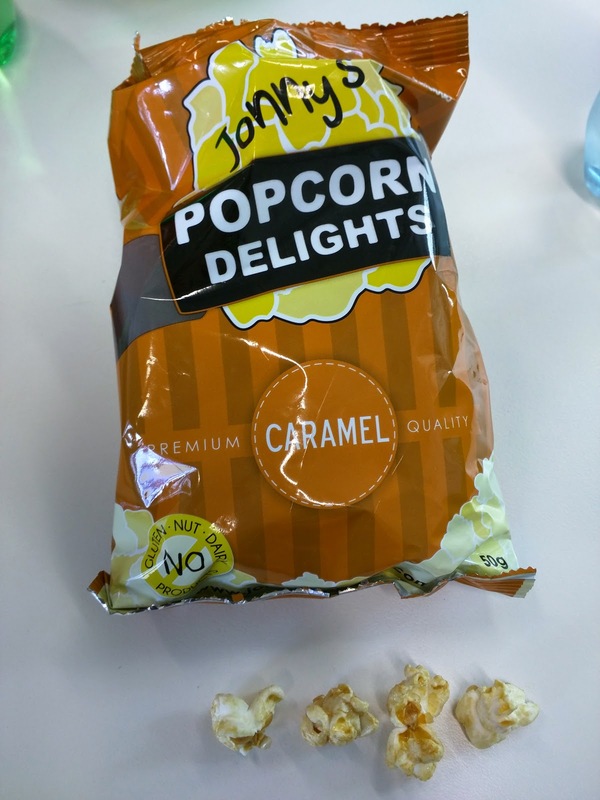 The popcorn was the first thing I tried, supplied by Jonny's Popcorn. 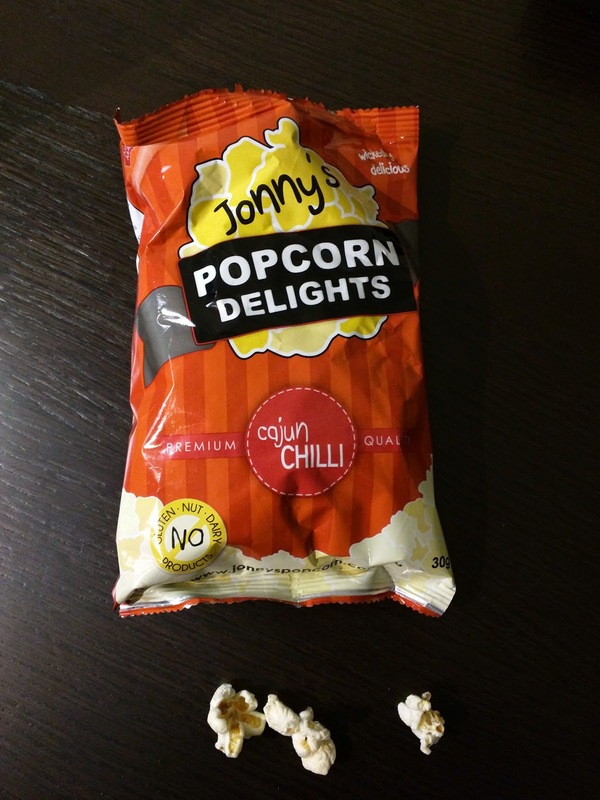 Jonny's Popcorn began when Jonny visited the US, and discovered, and subsequently fell in love with, kettle corn. I understand completely! He started a popcorn cart, and expanded the brand to be distributed nationwide. 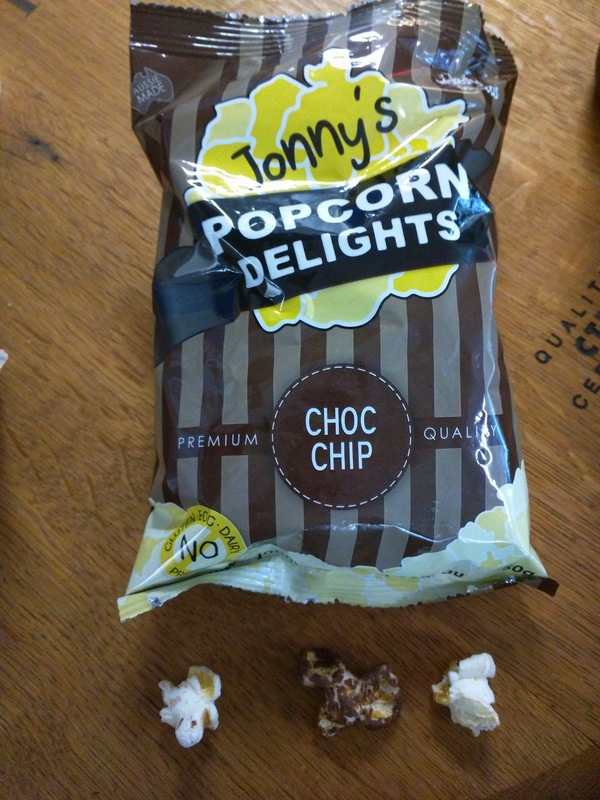 Jonny's Popcorn comes several flavors, both savory like canjun CHILLI, or sweet, including Sweet & SALTY, CHOC CHIP, CARAMEL, and BUTTERY. Yes, capitalization theirs. Unfortunately, I didn't love any of it, and I tried all of their flavors. Sweet & SALTY. Now, that sounds like kettle corn to me. And ... I love kettle corn! Sadly, this wasn't really sweet. Nor particularly salty. It certainly did not remind me of kettle corn. It was just ... popcorn. Meh. Update, 2016: Ok, so, it grew on me. It was just a different kind of kettle corn, not the style I'm used to. It was indeed crunchy, sweet, and salty, and thus fairly addicting, even though I wouldn't rave about it. "Choc Chip is a balanced mixture of Chocolate covered popcorn and our famous Sweet & Salty popcorn. 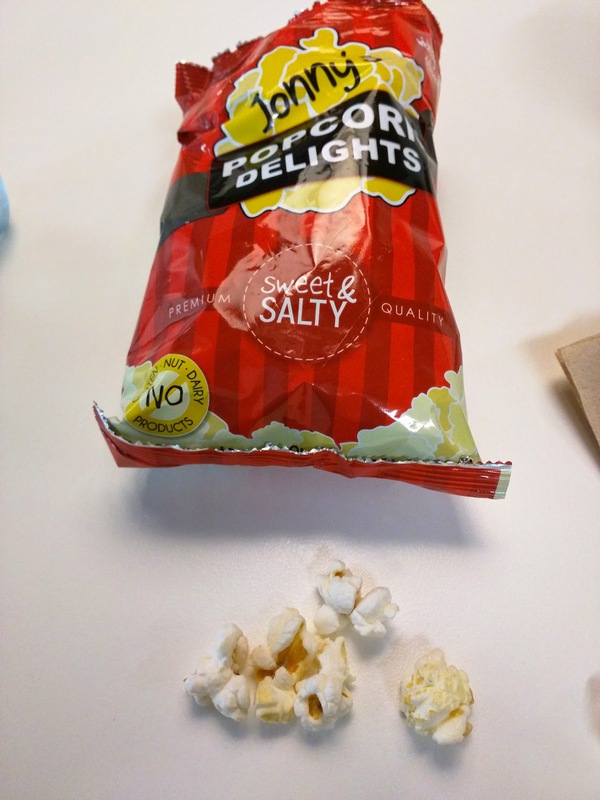 This popcorn is sweet, light and crunchy with just enough Chocolate to keep you interested to the bottom of the bag." 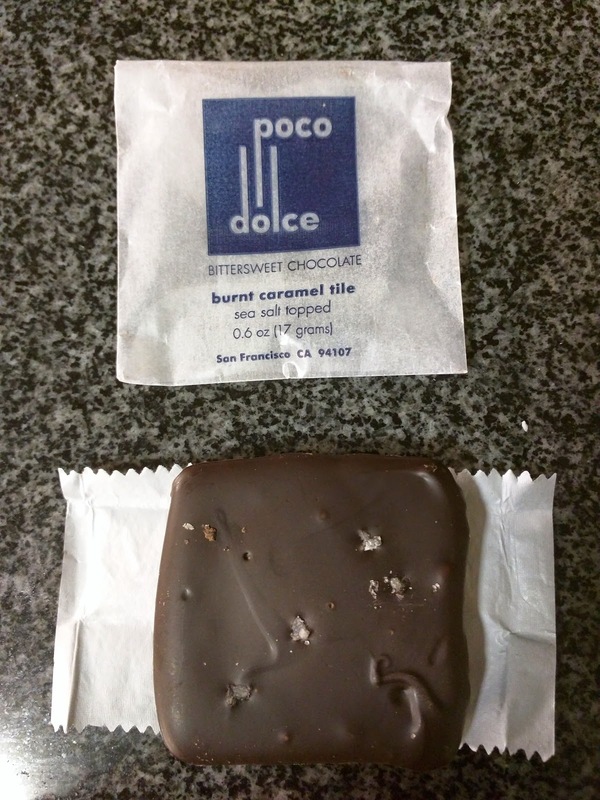 They claim this is a balanced mixture, but there were far more plain pieces rather than chocolate covered. The plain was apparently Sweet & Salty, but it just seemed buttered, or perhaps oiled. It was really strange to have this popcorn alongside the chocolate popcorn. I did like the chocolate covered popcorn however, as it was a bit sweet and salty, so they were true to their claim that there was just enough chocolate to keep me interested, as I did keep digging through the bag looking for more chocolate. Overall, the chocolate covered was fine, but it wasn't really remarkable, and I really just wanted to freeze it. Popcorn is always better frozen. My favorite of their popcorns however. "Cooking this popcorn in a hot kettle caramelises the sugar creating a sweet, rich crunchy shell." I didn't really care for this. The caramel flavor wasn't very rich, and the kernels weren't that well coated. No crunchy shell as promised. Perhaps it would have been better if I froze it. Very lackluster caramel corn. Update, 2016: I think I partially understand why this popcorn isn't awesome. It has no dairy. No butter, no cream. The caramel flavor is artificial. So, that is a pretty major strike against it. And, as I mentioned last time, it also isn't that well coated, not as decadent as I'd like. But, just like the Sweet & SALTY, I did actually enjoy it this time around. Expectations are everything. I wanted to like this one. It was spicy. But there was something about the spice that I just didn't like. I shared it with several others, none of whom liked it either. But yes, it was spicy. It was my first night in Sydney. I was jet lagged. I needed dinner. I knew from past experience in Sydney that fine dining is not where Sydney's strengths lie (the Thai food, the neighborhood cafes, the gelato shops those are all amazing, but fine dining? Not so much, particularly compared to San Francisco). Yet I wound up at Lumi for dinner. This was a very, very odd choice, for so many reasons. First, Lumi had only been open for less than 4 months. Even in SF it takes months for a restaurant to hit its stride. Second, the kitchen is young - I read somewhere that the chefs are all in their early 20s. They had industry experience, but, not much. Third, Lumi serves fancy food, which I'd already sworn off in Sydney. Dinner is an 8 course degustation only, for $95 AUD. 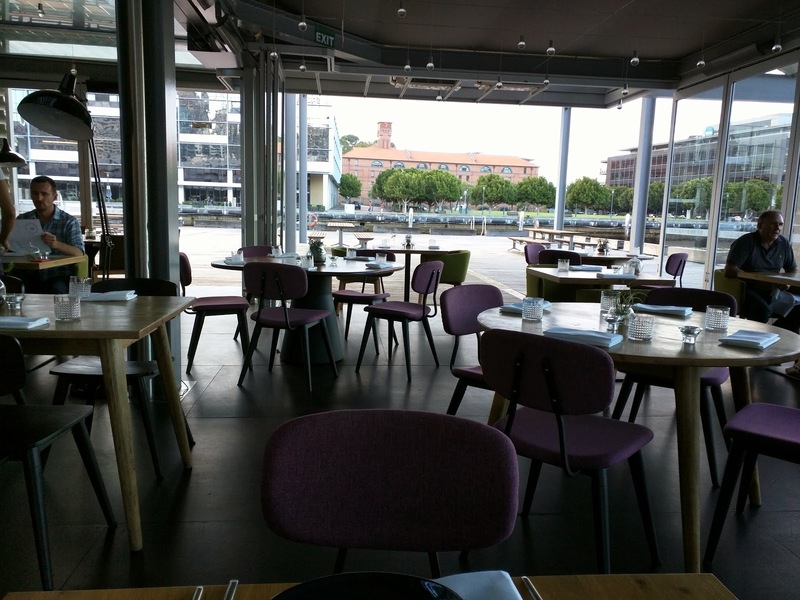 There is no a la carte menu for dinner, only for lunch Thurs - Sat. So why did I land there? Well, I had read good reviews, but mostly, I was lazy. Remember that jet lag? It zapped my ability to exert any effort, and Lumi is conveniently located right next to my office. I needed food, and it was within easy stumbling distance. It also looked like it was about to rain, and I was totally unprepared for rain, no umbrella in tow. So I took the path of least resistance. I also knew that they had a small bar area, with a "bar bites" menu. Even though the bar bites menu was lacking some of the dishes I really wanted to try, there was no way I had it in me to sit down to a full 8+ course degustation, so Ojan and I were intending to sit at the bar. Plus, I hadn't made a booking, which I knew would be essential for a Friday night. But ... the bar area was reserved for a private party. Doh. Since we were still on US time, we arrived right at opening at 6pm, and they had one table that wasn't booked until 8:30pm. We were told that if we promised to be gone before then, we could have the table. Great! Except ... I didn't want a huge degustation menu! We were in luck, as they offered to let us order off the a la carte menu instead, to speed things up. This was even better, I could get the dishes I'd been eying, and get a regular table. Perfect! Overall, it was a nice experience. The service was friendly and relaxed, not stuffy fine dining, even though they do serve upscale cuisine. A different staff member seemed to bring out each dish, including some of the cooks, so we got to interact with many different people. The space was the most impressive part, located on a wharf, and designed to take in all the light possible, really an incredible ambiance. The food was all innovative and good, uniquely plated, but not particularly memorable. 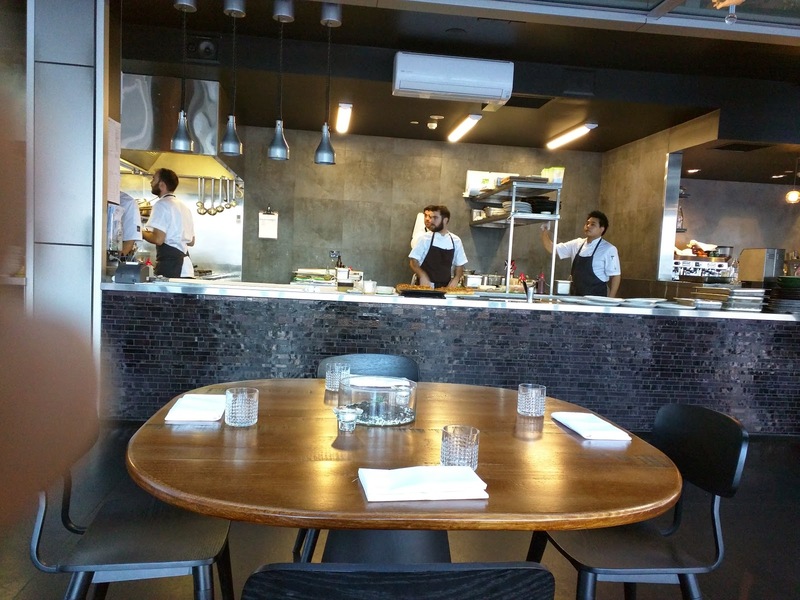 For the Sydney area however, it is a very unique experience, and the kitchen is obviously talented. 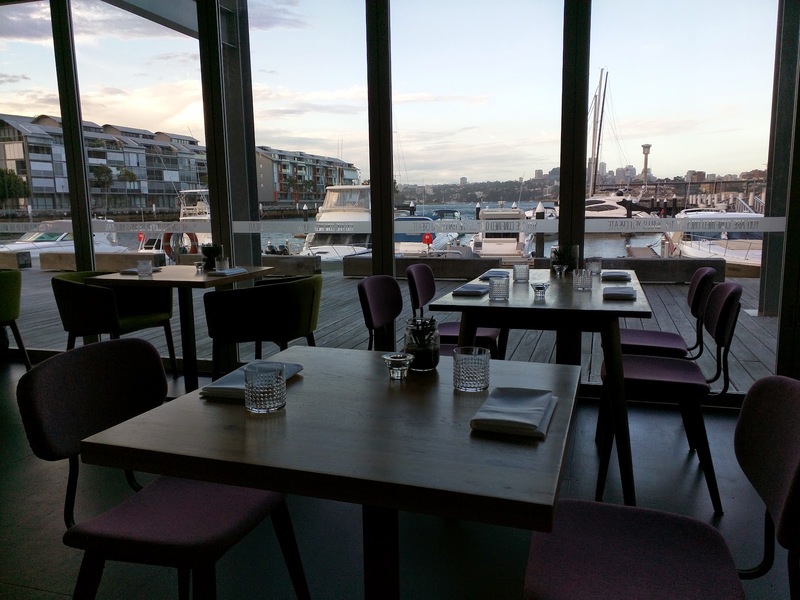 I will likely return next time I'm in Sydney to see what they do as they mature, and in particular, I would consider the degustation, as it seems to be where their strengths lie, and is really quite reasonably priced, particularly compared to the rest of Sydney! Open Wall to the Harbor. The space was the most impressive part. The wall completely opened up to the harbor. It was actually a tiny bit chilly at our table with the breeze blowing through since it was unseasonably cool, but the open air setting was really a wonderful ambiance. The openness gave all the good sides of both being inside and outside all in one, and it created a more casual feel as well. Looking the other direction, through the windows along the front side, were the boats. There is something to be said for being located out on a pier, with boats right outside the window! So peaceful. The harbor location may be a few steps off the beaten path, and it isn't somewhere you'd just find if you weren't looking for it, but the location is lovely, even on a colder, windy, almost raining day. I can only imagine how dramatic it is on a nice day, or during sunset. I'm always a sucker for open kitchens, so I appreciated the open kitchen. Not only was it fun to watch the chefs meticulously plating the dishes, it also just added to the overall open feel. Since we were one of the first parties seated that evening, the kitchen wasn't very busy when we arrived, but you could tell it was the calm before the storm. I enjoyed watching the staff kick into action, the pace of the kitchen picking up as more tables started to fill. Parmesan Churros with Roasted Eggplant Dip. $12. 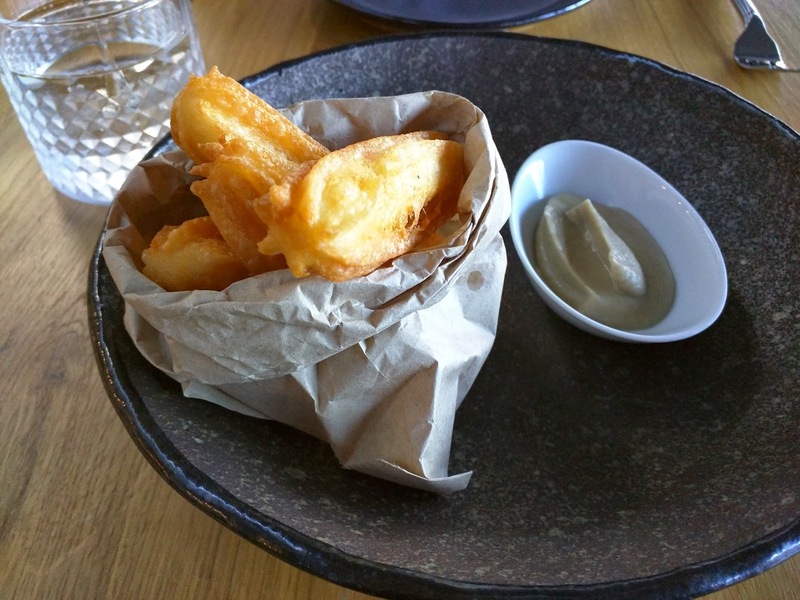 We started with a really creative sounding appetizer: savory churros! With ... eggplant dip? Craziness. I had no idea what to expect. The presentation was creative, served in a little paper sack. Like the ambiance, it mirrored the casual feel, although clearly a very interesting dish, not just a basic bar snack. Available at the bar, or during lunch as an a la carte offering, but not part of the degustation or dinner menu. The churros were piping hot, clearly delivered fresh out of the fryer. They had been properly drained, and were not oily. As expected, they were savory, no real sweetness to the batter, and had a slight parmesan flavor. They were nicely crunchy. On the side was the creamy eggplant dip, super smooth, no bits of anything in it. This wasn't a combination I would have ever come up with, but it was definitely an interesting one, and it did work. Overall, it was definitely fascinating, hot and fresh, but I wouldn't get these again. I think a different dipping sauce, one with some zing to it, would be more successful. $12 for 4 was fine for a bar snack. Squid Ink Chitarra, Orange Buerre Blanc, Bottarga, Sea Urchin Scamp. $22. Next up, the dish I had been eyeing since I discovered Lumi: Squid Ink Chitarra, part of the degustation, but not available as a bar snack, so we weren't originally going to be able to order it. This dish had me written all over it. I love squid ink pasta. I love cream sauces. I obviously love uni enough to have a label on my blog for it. So this was a must order, and I was absolutely thrilled that we were able to order off the full a la carte menu rather than just the bar menu, so we could select this dish. All my excitement faded away when the dish was presented however. Where was the urchin? In its place was ... scampi. What!!! I do wish that when I ordered the uni dish, I had been informed that the uni was not available, and that scampi would be substituted. Although, perhaps I would have changed my order, and then I would have missed this great dish. It turns out, I had no reason to be upset. Sure, I didn't have my precious uni, but the scampi was very, very tasty. I don't think I've ever enjoyed shrimp, or any shrimp-like creature, so much. It was fresh, delicate, slightly sweet ... just far more interesting than I ever imagined possible. I believe it was just lightly cured, or perhaps even raw? It inspired me to order more scampi, and other sea bugs, during my time in Sydney. The pasta was a perfectly cooked al dente. The buerre blanc was creamy, and coated the pasta well. It was a bit hard to eat given the way it was served as a perfect stack, but I did love the presentation. Overall, this was very good, but I didn't love it quite as much as I hoped to. I think my expectations were probably just set unrealistically high. 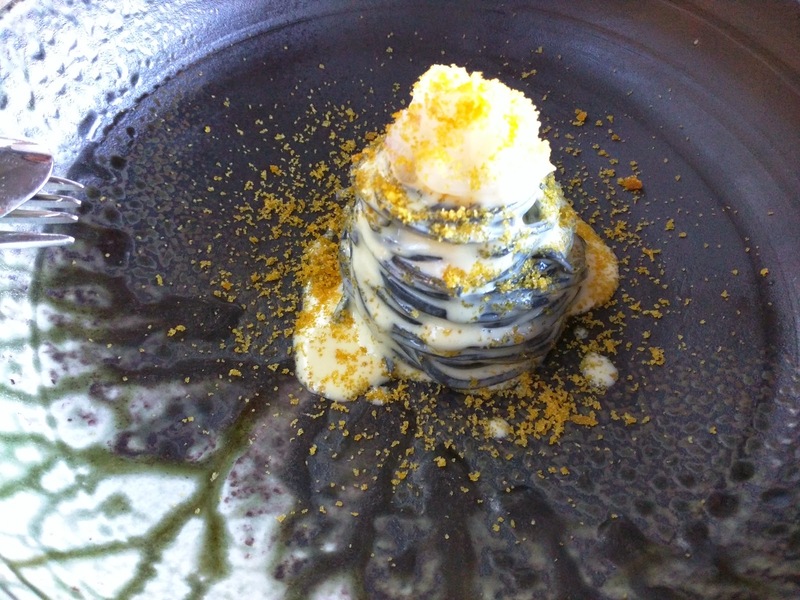 This dish seems to be one Lumi is evolving, as earlier reviews I read featured a stinging nettle pasta rather than squid ink, with a mussel cream sauce instead of orange buerre blanc. Any version of unique housemade pasta, with cream sauce, and seafood sounds good to me though! 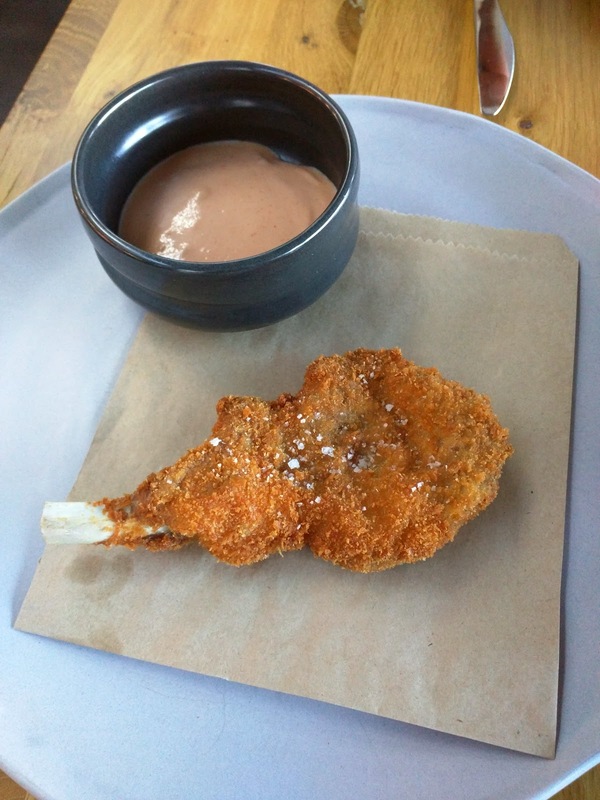 Lamb Cutlet Milanese Style, Smoked Cocktail Sauce. $15. Finally, another bar bite, lamb cutlet. Again, since it was a bar bite, the plating was a bit more rustic than the previous dish from the degustation. You may recall that I don't like lamb, but Ojan was hungrier than I was, so he selected this as another bite for himself. Of course, even though I don't like lamb, I had to try a bite. It was ... well, lamb. But if I was ever going to like lamb, coating it in crispy stuff and serving it with a smokey aioli was a good way to do it. I still didn't like it, but it was really nicely fried, and the creamy cocktail sauce was tasty. $15 might have been a little high for a rather small piece of meat however. Evergreen: Sorrel, Lemon Basil, Mint Shiso, Parsley. $15. We wanted to end the meal with something sweet, because, well it is me, and I kinda live for dessert. The one dessert on the a la carte menu (yougurt ice cream with cherries) wasn't really calling out to me. Luckily, when I asked about dessert, our server told us that she could probably get the kitchen to offer up the palette cleanser from the degustation menu, served before the heavier regular dessert. She highly recommended it, and it sounded crazy and unique, so we went for it, even though I admit that it wasn't really what I'd normally pick either, particularly as it was a frozen dish, and I was already a bit chilly. The presentation of the "Evergreen" was absolutely stunning. And this was just the palette cleanser! Given the other dishes I saw coming out of the kitchen the regular degustation menu is more in this style, and it was just our ordering of bar bites that yielded the more rustic dishes you saw above. So, where to start. 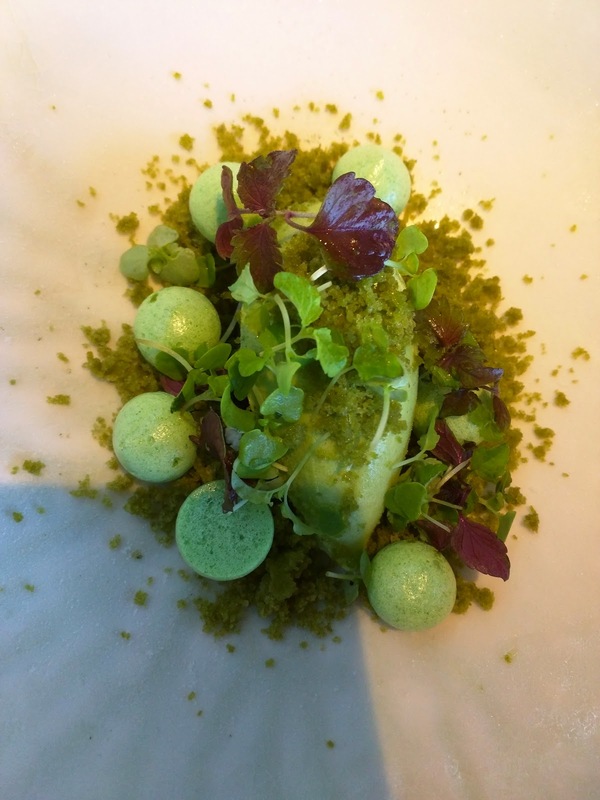 There was a green sorrel sorbet. Green shiso leaf jelly. Green lemon basil granita. Tons of fresh microgreens. Little green mint meringues. The dish name, "Evergreen", suddenly made sense. This was crazy unique, certainly one of the most interesting desserts I've ever had. There was something in the mix of herbs that made my tongue tingle just like when eating fresh tarragon. It was light, it was refreshing, and I'm sure it served its place as a palette cleanser well. But ... it wasn't really my thing, at all. Interestingly, Ojan, who generally just eats a bite or two of dessert and never loves it, really did like this. Since this didn't really satisfy my need for decadent dessert, I may or may not have stopped at Chat Thai on the way back to the hotel for a second dessert. $15 is a bit pricy for a palette cleanser, but it was a complex, intricately plated dish and certainly the most memorable dish of the meal. A month (or two) devoted to Sydney! This month, I'm going to do something a bit different. Rather than just use Tuesdays for "Travelin' Tuesdays" posts, as I did with Boston, Tokyo, London, and New Hampshire, I'm devoting the entire month to reviews focusing on my favorite city in the world: Sydney! You've probably heard me mention Sydney in the past. Besides places I have actually permanently lived, it is where I've spent more time than anywhere else. I've spent about 5 months there now, spread over the course of several years. My recent visit was just shy of 3 weeks, not nearly long enough! Anyway, 3 weeks was plenty of time to check out a slew of new restaurants, plus re-visit all my favorites. I'm going to stick with my regular format of using particular days of the week for a given theme, except, all will be related to Sydney! The Monday lineup will start with chain restaurants, including worldwide dumpling sensation Din Tai Fung, bubble tea from Chatime, and incredible fries from Snag Stand. Then I'll cover some bars, but not just any bars, ones serving quite good food, like the memorable crispy mac and cheese balls at Pocket Bar or the molecular gastronomy Pocket Bar. And finally, I'll cover what Sydney does best, brunch at a bunch of cafes, like Bill's, which broke my heart this time around, Trio with its excellent beachfront location, and the creative Devon Cafe. Tuesdays will be travel related, in this case, the Qantas lounges, starting with the brand new First Class (and Business) lounges in LAX and then SYD (again, both the business and first lounges), my in-flight meals to (and then from) Sydney, and the comparative differences in executive lounges at the Westin and the Sheraton on the Park. Wednesdays will be regular restaurants, including a slew of thai restaurants (like the Sydney institutions of Chat Thai and Home Thai, plus my favorite Sailor's Thai Canteen and the more formal Restaurant), plus lunch and dinner at a scattering of other restaurants, like Sokyo for mediocre sushi, Ms. G's for really fun Vietnamese, Chinatown Noodle Restaurant for great dumplings, Governor's Table for "Australian", Lumi for innovative cuisine, Watsons Bay Beach Club for some not very good seaside fish & chips, Bentley for fine dining, and Pinbone for the top dinner of the trip (it was so good, we went back for brunch the next day!). Thursdays will be bakeries (including a cronut from Bécasse, the best bread I've ever had from Dough Collective, epic pies (both sweet and savory), from Pie Tin, decent cookies from Madhouse Bakehouse, donuts and good coffee from Workshop Espresso, and ice cream (like my old standby Gelato Messina, classic Streets ice cream treats, and crazy asian creations from Chanoma cafe). And on Friday's we'll explore packaged snack foods, such as Jonny's Popcorn, Carmen's muesli, OAK flavored milk and Nippy flavored milk, crazy varieties of chips, and some actually tasty bars from Be Natural and breakfast bars from SuniBrite. 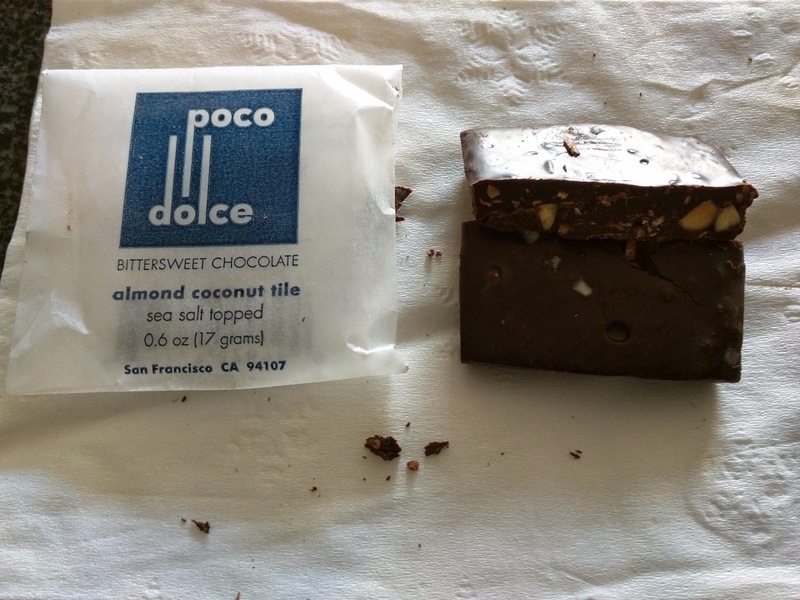 Polo Dolce is a local San Francisco confection maker, producing mostly chocolate (bars, bon bons, and truffles), but they also make assorted toffee, caramels, peanut brittle (available salty or spicy), and hot chocolate (bittersweet or mint). 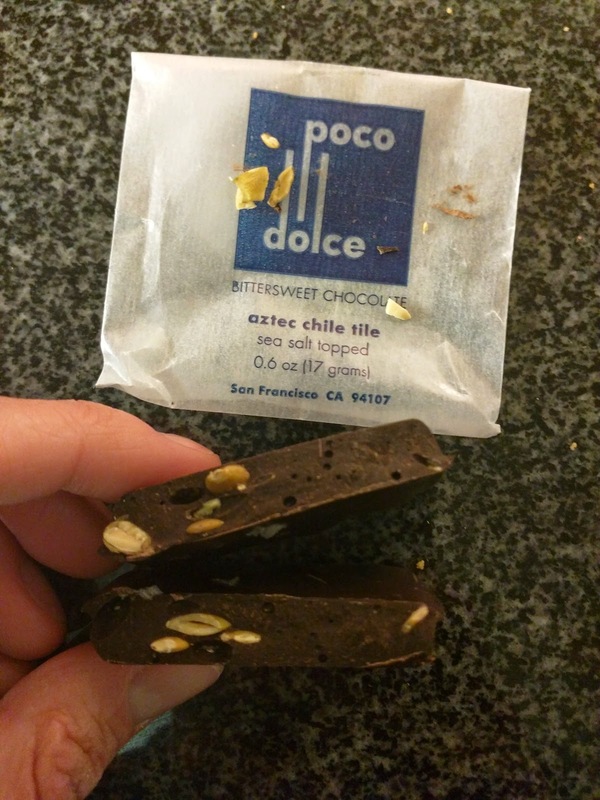 I first discovered Poco Dolce back in February 2012, when I tried the popcorn toffee, toffee with bits of popcorn inside, covered in chocolate. I was fascinated, and made a note to try more of their products. I blogged about it even, sharing the tip with you too. And then ... I promptly forgot. Whoops. 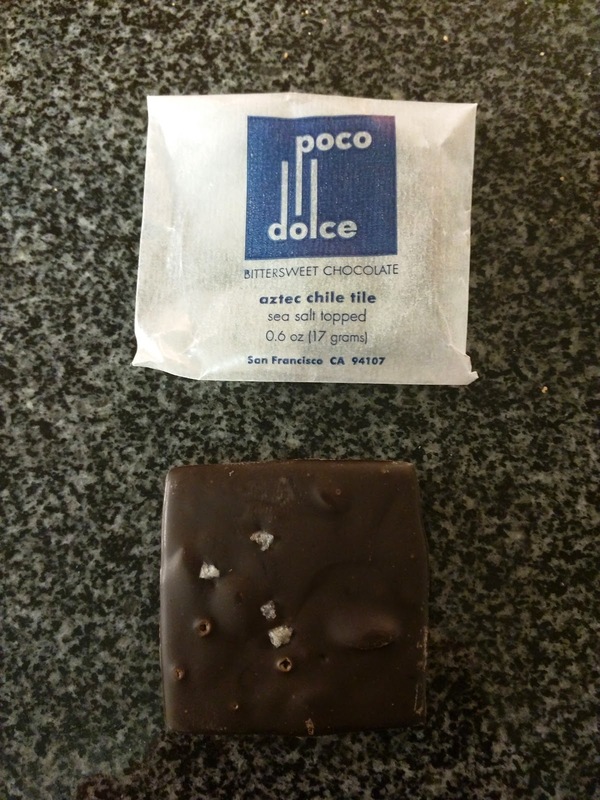 I knew when I saw Poco Dolce at a local artisan's market that the name sounded familiar, but I couldn't place it, until I looked up my notes later. Anyway, this time around, I tried a bunch of the "Tiles", their signature product, available in 9 different varieties, ranging from a simple sea salt version, to one with Ghost Chiles! The tiles are all made from bittersweet chocolate, plus some mix-ins, and are finished with grey sea salt on top. "This is what started it all in 2003! Still our most popular chocolate, each Burnt Caramel Tile is crafted by hand with bittersweet dark chocolate and a Burnt Caramel Toffee center, then finished with Grey Sea Salt. The amazing flavor of the toffee, which has been compared to the top of a crème brûlée, pairs perfectly with our dark chocolate while staying "not too sweet."" I started with the brunt caramel tile, the first product they ever made. It was a substantial size, not like a whole candy bar, but far bigger than say a Hershey miniature. Enough to feel like you were treating yourself, without feeling too decadent. Kinda a perfect size, if you ask me! It was topped with sea salt. It was also thicker than I expected, and as I tried to break off a piece, I quickly understood why. Breaking off a piece wasn't possible, but I wanted to show you what was inside, so I used a knife. There was a large piece of toffee inside, smothered in the chocolate. 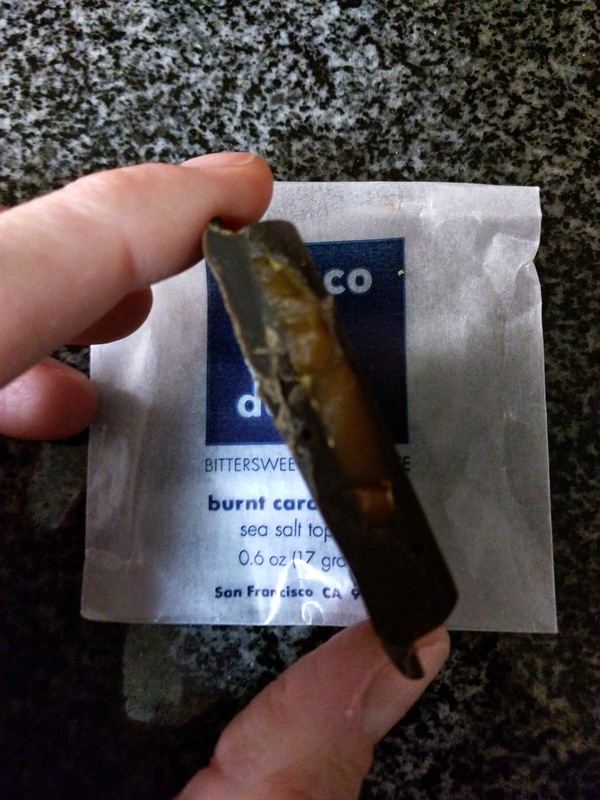 The toffee was indeed burnt caramel flavored, slightly bitter. The dark chocolate was decent quality, better than most. But the toffee was a hard style, and the burnt flavor just didn't do it for me. I had several of these, and gave away the rest. "Don't write this one off as just another gimmicky spicy chocolate; this exciting Tile is done just right. First crafted in 2004, we've brought together Bittersweet chocolate, cinnamon, ground chiles, toasted pumpkin seeds, and a pinch of Grey Sea Salt to produce a unique side of chocolate that still begs to be tried. Not intended to be too spicy, this Tile features just a little heat in the finish." Next up, the Aztec Chili. This one looked similar on the outside, nice dark chocolate, scattering of large sea salt crystals on top. This one easily snapped in half, revealing pumpkin seeds inside. I loved the crunchy aspect the pumpkin seeds brought to the bar. Why don't more bars have pumpkin seeds in them? The spicing was also incredible, cinnamon and chili, and it did pack some heat. I really enjoyed the spice level, and how it combined with the slightly bitter pumpkin seeds, and was rounded out by the salt on the finish. Really complex flavors here, quite fascinating to slowly consume. My favorite of their bars by far, and I'd certainly go out of my way for this. "The unique combination of roasted, slivered almonds and toasted coconut makes our Almond Coconut Tile a true standout. Folded by hand into our signature bittersweet dark chocolate and finished with Grey Sea Salt, the flavor and texture of this Tile is one you won't soon forget." Next I went for the almond coconut. It looked the same from the outside, smooth dark chocolate, sprinkle of sea salt. But inside was quite different. Slivered almonds and shredded coconut were mixed in with the chocolate. It was ... fine. 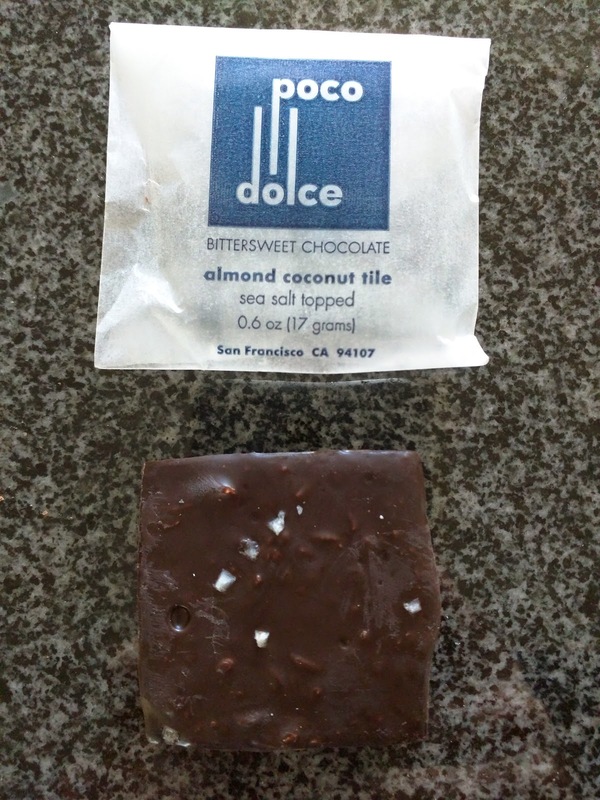 I liked it more than the burnt caramel, but the almonds and coconut added more texture than actual flavor, and the coconut shreds I didn't actually love. There was something slightly off putting about them.